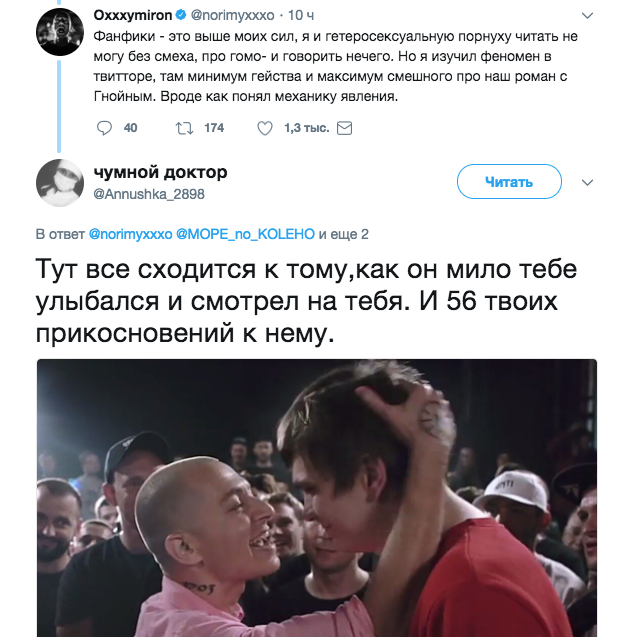 Russian rapper Miron Fedorov, aka Oxxxymiron commented on his rumored affair with rapper Gnoiny (Slava KPSS). Oxxxymiron in his Twitter called his fans shippers, further explaining the term. "Mysterious young girls (I originally thought that they were gay, but I was wrong), coming up with the world in which Slava and I are in love like heroes of chivalresque novels," - he wrote. Rapper's post caused a stormy discussion in the comments, among them, the so-called shippers, have shown their creativity. 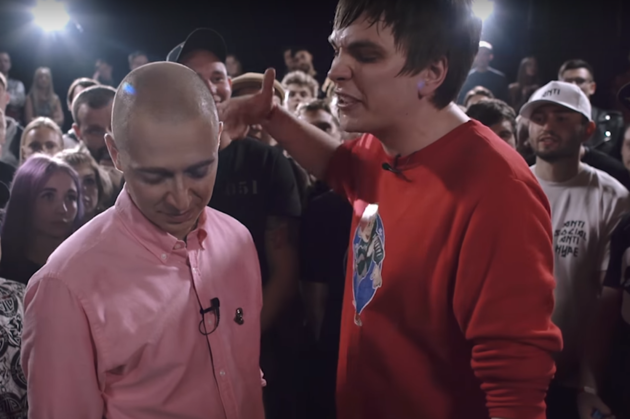 Earlier Oxxxymiron got into a rap battle with Slava Kpss and lost with a score of 5:0. Video of rap battle got 25 million views. Russian rapper said he could not read about such rumors without laughing. Rapper Miron Fedorov, better known as Oxxxymiron, reacted to the work of fans, who fantasize in their fanfic about his affair with Gnoiny (aka Vyacheslav Maschnov). "Fanfics - this is beyond me, I can not read them without laugh, there's not so much about homo. There is about our affair with Gnoiny. It seems that I understood the mechanics of the phenomenon. Oxxxymiron (real name Miron Fedorov Yanovich ; b. 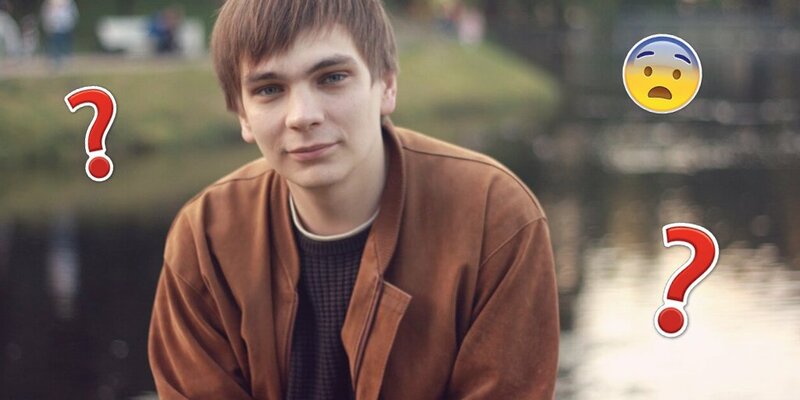 31 January 1985, Leningrad , USSR ) - Russian-language rap -, grime -, freestyle - singer and CEO of the booking -agency «Booking Machine». One of the founders and a former member of the label «Vagabund». "I was a typical seventeen-year-old homophobe, that's all. For any hetero teenager homophobia is very natural (I'm not saying "normal") thing. You are still not quite a man and you are very much afraid of everything that can cast doubt on your masculinity. And the easiest way to prove it is to establish yourself at someone else's expense. That is, it is not an ideology, but merely a conditioned reflex. In the aesthetic sense, nothing much has changed - if I see two kissing dudes, then, most likely, I will automatically give them the stink eye. But in terms of attitudes towards gays in society, I, of course, underwent a certain evolution. First I went to Oxford, where I first saw live gays in general, and saw that it was not Satan with horns and hoofs. But I really rethought the attitude after returning to Russia. Because here homophobia, it's not just "I do not like it" - but "deprive rights, lock up houses, stone to death." And it's natural that I do not intend to associate myself with such views, it's clinical idiocy and mass hysteria, which is used to earn political points. Very brutal homophobes, who can not talk about anything else, in an ideal world should have their clubs, so that they go there, discussing all this, without interfering with normal people. I do not like dumb homophobia".